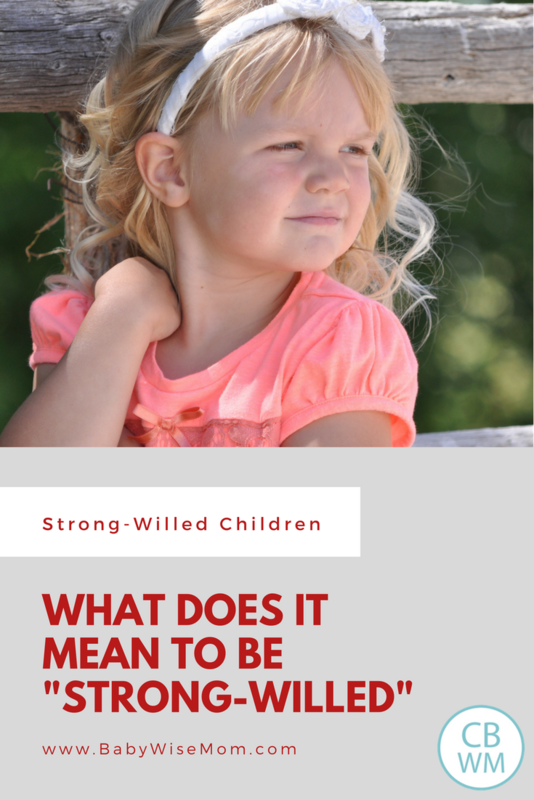 After reading my review of Parenting the Strong-Willed Child by Forehand and Long, you might be wondering what exactly constitutes “strong-willed.” The strong-willed child is independent, assertive, confident, determined, persistent, outgoing, and questioning (pages 8-9). Most of these things might sound good to you. They actually sound like good qualities to me. Then can be good qualities. Forehand and Long point out that they want to help parents nurture the positive sides of these qualities while minimizing the impact of the negative sides of these qualities. If you stop and think about it, you can easily see how these qualities could lead to some conflict between a 2 year old and the parent. Left unchecked, these qualities can become quite the nightmare by age 6. There is debate in the academic world about nature vs. nurture. I think that most parents who follow Babywise or Baby Whisperer believe that nurture has an impact on the development of the child (if not, why are you doing it?). So yes, there are things you can do to help your strong-willed child magnify the positive sides of being strong-willed and minimize the negative sides. As I stated in my previous post about this book, the skills this book teaches should be used by all parents of all children, no matter how strong-willed your child is (page 45). But these skills were “originally developed and shown to be clinically effective with strong-willed children who have high rates of non-compliance and other disruptive behaviors” (page 46). This book has a test for you to administer to your child to see if your child is strong-willed (or to what magnitude your child is strong-willed). They say that your child will comply less often in the test as you give more directions, you need to record if your child complies within 5 seconds, the parent needs to not do or say anything other than what the test instructs, and you want 60% compliance (18 out of 30). I thought it would be fun to do the test with Brayden (almost 4.5 years old). He complied for 28 out of the 30 instructions. With the last two, he finally started questioning why he needed to do what I told him to. He did comply, but not within 5 seconds. I was obviously pleased with the results since the book said my goal was 18 of 30! Now you have an idea if your child is “strong-willed” or not. I think that parents of “strong-willed” children probably know it, but this can help the ones who might not be sure. If you are having any difficulty with your kids (in other words, if you have kids), I really think this book can provide you with some excellent parenting tools to improve obedience levels. I just purchased this book today off Amazon! I'm hoping it will shed some light on why my very happy, obedient little boy has suddenly gotten a case of the "no's". I literally had to drag him kicking and screaming from the playground the other day, and he's only 20 months old!! Looking forward to implementing what I read…and quickly. :)Thanks for the book suggestion! You are welcome Jenn 🙂 Let us know how it goes.